If you are getting this error on WhatsApp it means you have a problem with your Android device’s storage or you have a problem with your files. You can find some steps here to get rid of this error. They are quite easy to apply on Android devices and we don’t provide any unofficial resources for you to resolve this problem. 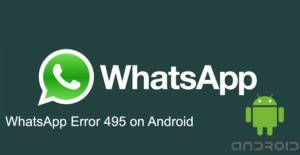 There are two ways to resolve 495 Error on WhatsApp. You will find these ways on here. See Also: Can You Delete Facebook Account without Waiting 14 Days? There are 3 ways to fix Error 495 on WhatsApp. We will summarize all these ways for you on this page for expert users. If you are not expert please click here for detailed information and step by step guideline. Shortly you will need clear data and cache of Google Play Store application first. Restart your phone and try again. Clear cached data of your phone. Clear your phone storage with a file manager application and also clear all applications that you don’t use, take a look at old datas and remove them. If all these things don’t work for you, click here to go to official download page of WhatsApp and try download and install the application from there. Don’t forget to allow unknown sources to work on your device. We provided the basic solutions for you on this page. We hope that this is going to help you. However we also recommend you to check your recent Android operating system. If there is a new version of your Android OS, please update it. If there is not any of new version and if you couldn’t fix your problem, you will need to try for a hard reset. However hard reset should be the last option for you since you will lose all data on your device. Contacting WhatsApp support will be the best option for you.